Ya girl is back. Or at least, ya girl is trying her best to be back. I’m still nowhere near being unpacked (my room somehow gets more embarrassingly messy the harder I try to clean? I dropped out of science early in high school but I’m pretty sure there’s nothing in all academic teachings that could explain this phenomenon) but I’m cooking more and attempting to get back on the freelancing stallion and am generally determined to recapture my ambition. For something. I mean, I never lost my ambition of being outstanding in the field of excellence, I just lost my drive due to Extenuating Circumstances and if I’m being scrutinisingly harsh, which I don’t enjoy, I probably got a bit exhaustedly complacent in that position of, well, not even trying to try. I’m not sure I’m quite approaching my old burn-all-candles-at-all-ends level, but I am rewatching a lot of Parks and Recreation to re-absorb all of Leslie Knope’s power (“there’s nothing we can’t do if we work hard, never sleep, and shirk all other responsibilities”) and I am trying to write more and I am going to start doing my chocolate cookie dough pretzel thing deliveries again! Because ya girl is also somewhat broke. Moving house and being too busy/tired to maintain several sources of incoming cash is an expensive pastime. But also I miss scooting around town and dropping off parcels of deliciousness, like some kind of no-strings-attached moderately profitable fairy godmother. So if you’re in the Wellington CBD region and want some of the good stuff for yourself or for your secret admiree, all the information you need is here. As I said in my last post, I have started watching The Sopranos, and despite my immediate misgivings at the violence and boring wife-is-a-thankless-harpy outlawish-schlub-husband-is-horrible-and-also-the-beloved-hero tropes, it’s so compelling. And it makes me crave Italian food something fierce. 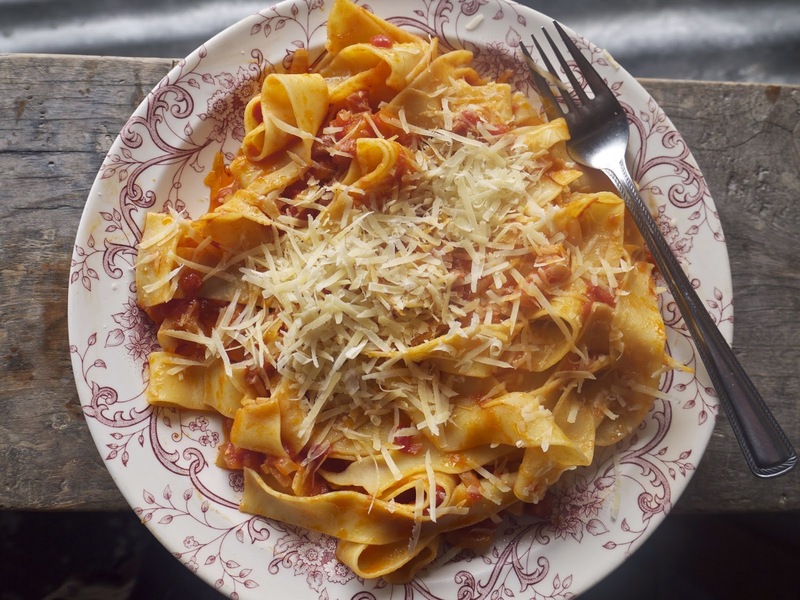 Initially I wanted to make meatballs but mine tend to fall apart and I didn’t have it in me on this particular day to bounce back from that kind of failure, so instead I went for something very easy – pasta all’amatriciana. I was hoping that it would translate to something to do with matriarchy, but it gets its name from being a dish from the region of Amatrice. 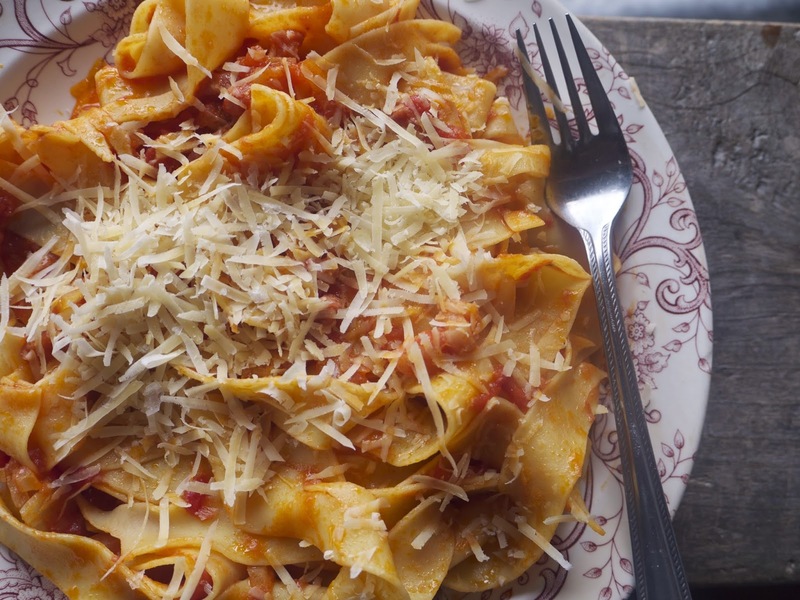 Which is nice in its own way – this is just pasta with bacon and tomatoes, but calling it by its proper name gives it a more official, elegant vibe, like, oh I’m just casually making myself this traditional recipe from a beautiful town in the Lazio region of Italy, how bout you? I slightly adapted a recipe from the Scotto Family, whose book Italian Comfort Food I own and adore. Half a cup of olive oil may sound terrifying in these austere times, but it becomes part of the sauce, making it rich and deeply flavoured and delicious and more than otherwise just a can of tomatoes. However, I understand you using less. Olive oil is expensive. 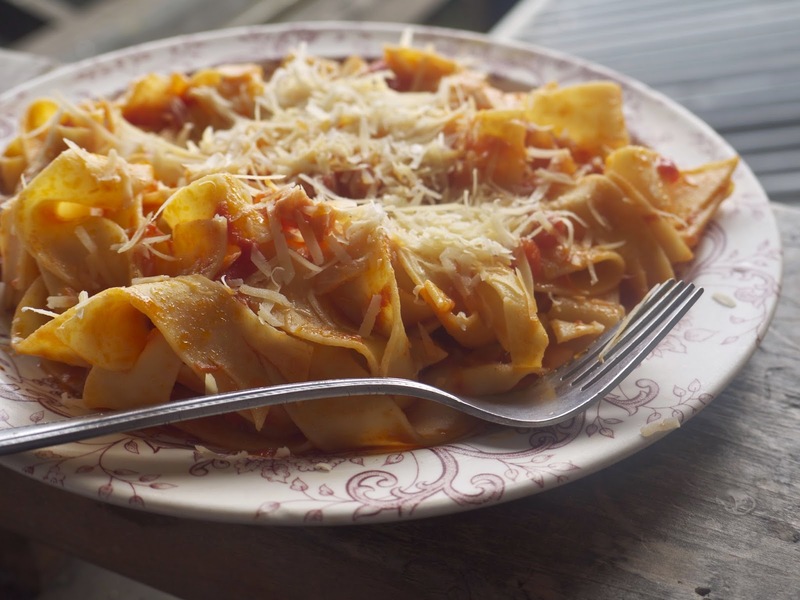 Their recipe called for bucatini pasta but I am a heathen and adore pappardelle, and it was on special at the supermarket – however if you can’t find it, my sneaky and ingenious trick is to get sheets of fresh lasagne and slice them into wide lengths. Or use whatever pasta you fancy. Bring a large pot of salted water to the boil and cook the pasta according to the packet instructions, or until preeetty tender. Meanwhile, heat the oil in a saucepan, and fry the bacon in it till crisp and sizzling. 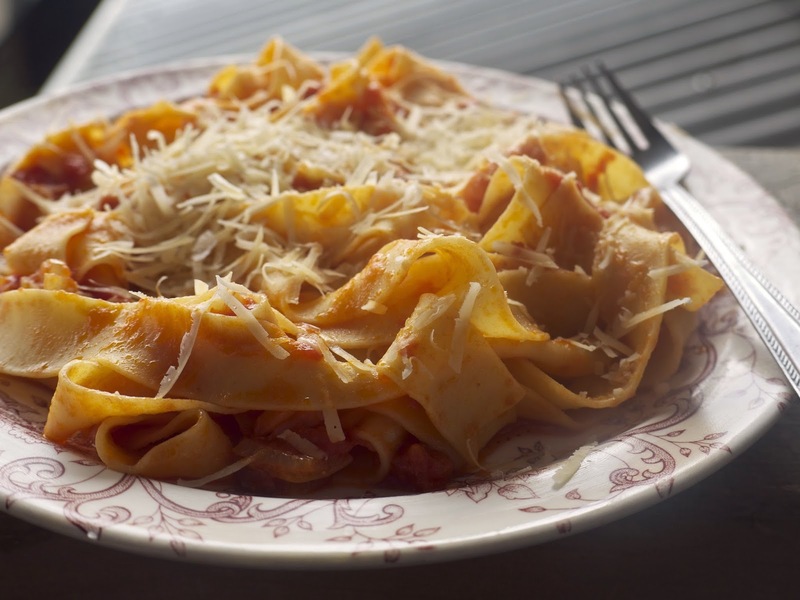 Remove the bacon and set aside – I just put it on the plate I served the pasta on – and tip the onions into the still-hot pan, stirring them and allowing to cook until softened, but not browned. Basically until that harsh onion taste has been cooked out. At this stage, tip in the tomatoes and stir over a high heat till the sauce is thickened somewhat – maybe ten minutes – then tip in the bacon and stir again for another five minutes or so. Drain the pasta and stir it into the sauce, still over a high heat, and then remove from the heat, add as much parmesan as your heart desires, and serve. I haven’t bought parmesan in forever, because every time I pass it in the supermarket I passively-aggressively sigh at myself like some kind of lazily-written thankless shrew wife in nearly any TV show and say “oh…no, no I shouldn’t, that’s expensive” even though the price is never going to change and I could pay a lot more for something else and have a lot less fun. I really should’ve bought some sooner, a fresh grating of it makes so many pastas and risottos more wonderful, and a little bit goes a long way. As I said a lot when I learned the phrase false economy: that’s not false economy! title from: PJ Harvey, My Good Fortune. I’ve loved this song since I first heard it in 2000, with its jangling chevron-like melody and satisfyingly ridiculous drawing out of words at the end of each refrain. And PJ Harvey is obviously a goddess. Beyonce’s performance of a medley of her entire self-titled album at the VMA awards. This is so important. I cried, I got the chills, I cried again. I’m getting chills just typing about it, thinking about her face when she sings Jealous or the sight of her standing in front of the word FEMINIST in enormous lit up letters or when Blue says “good job mommy”, I mean, just watch it. Liane La Havas, Hey That’s No Way To Say Goodbye. This wistful, dreamy Leonard Cohen song is made even more dreamy by her voice. Yeah Yeah Yeahs, Maps. Wait. next time: reading Harry Potter just makes me want to eat enormous feasts with hearty puddings and lashings of whipped cream, even though that’s actually more of an Enid Blyton thing, there is a natural echo of her words in JK Rowlings’ descriptions of food. Will see if I can make floating candles and a ceiling that looks like the night sky happen too. I just made this and it was phenomenal. Like a big warm pasta blanket of happiness! I love Pancetta. Definitely adding this to my to-do!